Like seriously, this is what i call apuruka smartphone lol. Am currently waiting for the release of this great sleek device. I've never seen such smartphone if i must say plus its amazing 4000mAh battery capacity. Am sure many people will open their mouth while watching this video. This video is the hammer test of Umi Touch. I dont think your current smartphone that you are using now can survive this test. 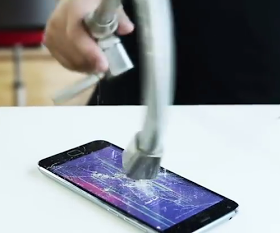 Even my Infinix Note 2 can never withstand or even survive this hammer test. Watch the 2mins heavy hammer test on Umi Touch below. What do you have to say about this smartphone and the video you've watched.